ILFOCHROME PHOTOGRAPH, 33 1/4" BY 17 1/4"
Tragically, Kilmer was killed in action in Europe near the end of World War I. In his memory, a section of the Nantahala National Forest in the mountains of North Carolina was named the Joyce Kilmer Memorial Forest... this area of virgin wilderness contains spectacular waterfalls and an incredible variety of trees, including yellow poplar, hemlock, sycamore, dogwood, basswood, beech, and several species of oak. Many of the trees are hundreds of years old. The Appalachian Trail winds through the Joyce Kilmer Memorial Forest, so hiking through the forest is allowed, but no vegetation, dead or alive, may be removed from the area. 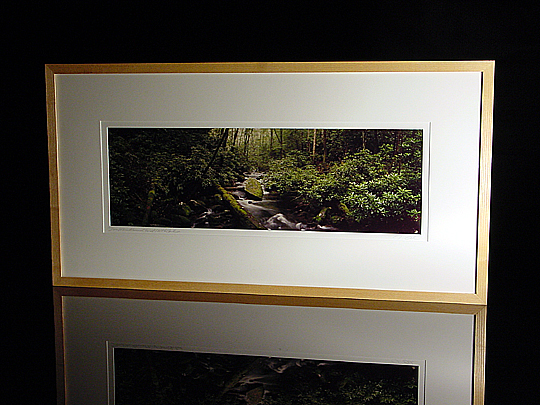 This is a really nice photograph of a creek that runs through the forest... the surrounding woods are beautifully dense and green, and the Ilfochrome process used in this print really makes the colors jump out.